The City Council of Lexington, Virginia recently approved a request from an organization known as CARE to hold a parade at the same time and traditional place as the Annual Lee-Jackson Day events hosted by The Stonewall Brigade Camp SCV. It is no secret that some members of the council, the outgoing mayor who forced through the vote, and the college elites have great disdain for the traditional values and views of the native community who still commemorate their Confederate history. These elitists have worked tirelessly to intimidate local venues in an attempt to disrupt the SCV's commemoration of the lives of Robert E. Lee and Thomas J. “Stonewall” Jackson in their final home and resting place. The latest action is not an act to solidify the community as CARE claims, but an attempt to silence the viewpoints of those they disagree with in the most disrespectful of ways. Unlike CARE, the SCV believes in freedom of expression and believes their viewpoint has every right to be expressed in the public sphere, but not when they choose to do so by attempting quash our right to give honor to the leaders and soldiers which we descend from. The Stonewall Brigade SCV believes the actions of CARE and others to disrupt the Lee-Jackson Day events is simply an effort to promote hatred for our ancestors and us and an attempt to cause confrontation. Therefore, we will seek to meet with the organizers of CARE and seek to show that our struggle is about honoring the good character of men like Lee and Jackson and not about hatred and perhaps join them in their efforts to denounce such. However, in the meantime we have decided that on the traditional weekend of our event to shift our focus onto promoting Lexington's rich Black Confederate History and call to honor the names of Levi Miller, Jefferson Shields, Jim Lewis, and others. Furthermore, if we cannot reach a consensus to respect our original event date, we plan to host the Lee-Jackson Day events in Lexington on the following weekend on January 21, 2017 which is the birthday of General T.J. “Stonewall” Jackson. 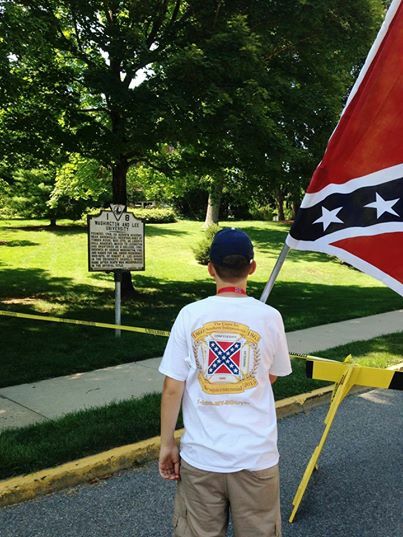 The Stonewall Brigade calls upon the President of Washington & Lee University to apologize for the university's mistreatment of a 15 year old boy this past weekend. "Since it was my first time in Lexington I wanted to see the Lee Chapel and the grave of Lee's horse Traveller. As I began to head for the Lee Chapel, a [campus] Police Officer stopped me and said that I could not enter the campus property with my Battle Flag or any images of Confederate Flags on any of my possessions including my clothing. I really wanted to pay my respects to General Lee and Traveller so I had to turn my shirt inside-out, take off my hat, and take off my badge." We have to wonder if this is the sort of reception that the thousands of visitors to Lexington and Lee Chapel can expect to receive in the future. The majority of these visitors are Civil War history enthusiasts and many can be expected to wearing items with flags or other images related to the Confederacy. We were even told that individuals bearing the likeness of Robert E. Lee were told they had to be removed before entering the Washington & Lee campus. W&L went so far in their overreaction towards participants, that they improperly blocked the main access road to VMI thus making it nearly impossible for visitors to the VMI Museum, George C. Marshall Museum, and VMI Post to find their way onto that campus. We ask Washington and Lee to issue this apology and abide by their own Mission Statement and not obstruct freedom of expression and thought and respect the viewpoints of others. We do however have to question the president's commitment to freedom of expression as he made the following statement in his July 8 address: “As a private university, we are not bound by the same legal and constitutional First Amendment constraints as public institutions.” Does this statement represent the best of academic freedom in America today? We do not think so. Therefore, we ask members of the public, donors to the university, and alumni to demand that freedom of expression be honored by the Washington and Lee administration and that an apology be quickly given to the young man who was treated with such indignity by the university. 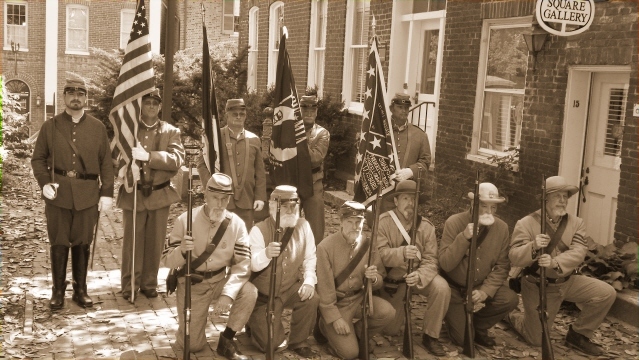 The Stonewall Brigade was honored to be invited by the local Veterans of Foreign Wars to help put on the annual Memorial Day program in downtown Lexington at the war memorial. The camp arranged for a Color and Honor Guard for the Day. Camp Commander Brandon Dorsey also gave brief remarks on the history of the holiday from its beginnings after the War Between the States as Decorations Day. On September 1, 2011, The Lexington City Council banned the display of Confederate flags for Lee-Jackson Day on city street poles. The Stonewall Brigade has actively resisted the city's adoption of the flag ban ordinance including holding a flag rally just prior to the vote. The camp has now established a heritage defense fund to raise money to take the city to court for violating our rights and the 1993 Injunction which forbid the city from taking actions to bar any display of the Confederate flag. The 1993 Injunction was the result of the city attempting to keep participants from displaying Confederate flags at the 100th anniversary program for the Stonewall Jackson monument at the general's grave.